Large bees in your yard might be a cause of immediate alarm, but if they're ground-dwelling bees, they're likely to be more of a help to you than a hindrance. Many types of ground bees aren't aggressive, but some can leave piles of dirt outside their homes that mar your landscape. You might be surprised to see several holes in your yard that sport a pile of dirt on the side, but this just means your yard was found suitable by some mining bees. These solitary bees let the females do the digging in separate burrows, while the males hover around waiting for attention. These insects aren't aggressive, so they're unlikely to sting you, even if you walk over the holes. Bumblebees, on the other hand, defend their nests with painful stings. They live in large colonies, often marked by bees frequently moving in and out of a single ground hole as well as guard bees hovering nearby. 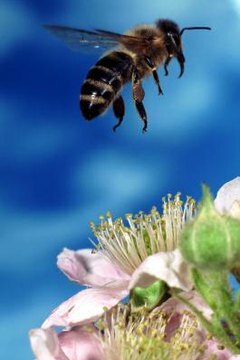 In both species, the bees top out at about 1 inch long, although many are slightly shorter. Several species of wasp might dig burrows in your yard, but these tend to be nonaggressive. Like mining bees, most are solitary, with the females living in the burrows. In some species, such as the cicada killer wasp, the female has a stinger, but she uses it only for hunting. She stings cicadas to paralyze them, then leaves them in the burrows for her young to feed on. These wasps can grow as large as 2 inches long. Digger wasps resemble cicada killer wasps, but are slightly smaller. Scoliid wasps eat grubs and grow to about five-eighths of an inch long. When your yard is inhabited by nonaggressive ground bees and wasps, no control is necessary. These insects help pollinate your garden and keep it free of pest insects and grubs. Most aren't active near the burrows for long, often just two to four weeks. Even aggressive bumblebees help pollinate plants, but if the nest is in an inconvenient location—one you like to frequent—it might be best to eliminate the colony with pesticides, such as those containing pyrethroids, to protect yourself from stings. Before you decide to leave a helpful underground bee colony alone, make sure it's housing nonaggressive bees rather than yellow jackets. Yellow jackets are small, about half an inch long, and extremely aggressive. They attack you if you get near their burrow, and they often land on drinks or food if you're eating outside—they can sting your mouth if you pull them close on your soda can without realizing it. Like bumblebees, they live in large colonies, but they're smaller than other ground-dwelling species.